Examining the Cynicism Concerning the Crypto Crash of 2018: Are Markets Discounting Fundamentals? 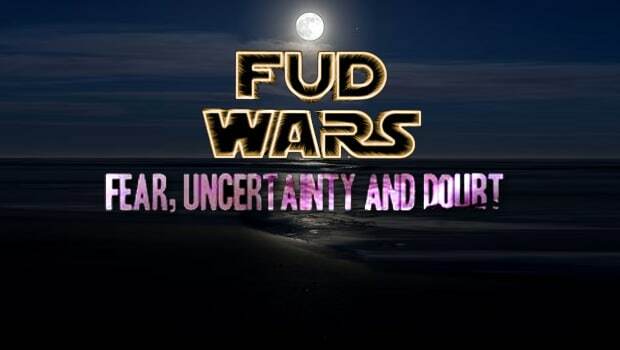 As you may have heard, there has been mayhem in the crypto markets. For a while, it seemed like crypto markets were immune to the carnage in stock and bond markets around the world. In recent weeks, that has changed in a big way. 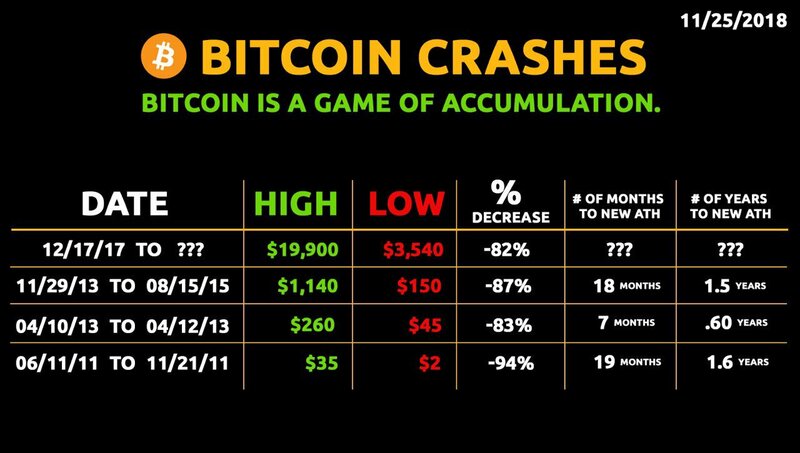 After a period of sideways trading and low volatility, the crypto crash of 2018 resumed in full force. 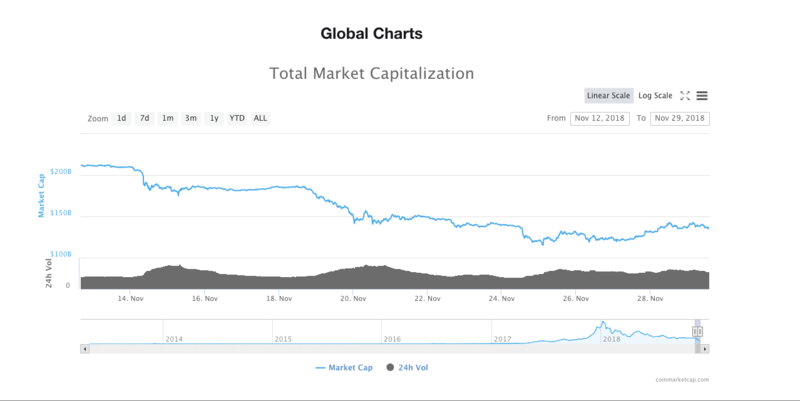 The cryptocurrency market as a whole shed nearly $95 billion in eleven days, falling from just shy of $210 billion to $115 billion over the period of November 14th to November 25th according to data from Coinmarketcap.com. The market has since rebounded and sits at $136.6 billion at the time of writing. The price of BTC declined almost 50% from its point of stability around $6,400 to a low of $3,604 on November 25th, according to the Coindesk Bitcoin Price Index (BPI). Since then, the largest coin by market cap has rebounded to a high of $4,353 only four days later. This marks the sharpest rise in months and could signal the end of the crypto crash of 2018. So long as the $3,500 support level remains intact, prices should continue to stabilize and start moving higher. During times like these, it seems as if all crypto is dying. Prices appear to be approaching zero. But it’s important to remember that this has happened before. It’s part of a healthy cycle that shakes out weak hands and sets the stage for the next leg up. Of course, if you’ve been holding since 2016 or sooner, even the recent bottom looks pretty good to you. It’s helpful to keep in mind that less than two years ago, during the first half of 2017, one bitcoin reached parity with one ounce of gold for the first time. And only seven years ago, in 2011, one bitcoin reached parity with one US dollar. But those who believe in blockchain don’t care as much about price action as they do about fundamental developments. Focusing on prices alone isn’t productive when it comes to crypto. There are much more pressing events happening with regard to this new asset class and the blockchain technology that underlies it. Prices will follow eventually, but the key thing is that the sector is developing and adopting is gradually increasing. Most of the criticisms of crypto are unfounded and they always get louder at times like these, despite all the positive developments taking place. Just check the Twitter accounts of Nouriel Roubini or Peter Schiff to see how strong the hatred of crypto can be. Of course, they have their own agenda and biases in play. Several new crypto trading services and products have been announced by some very big financial players. And two large institutions, one of them in the private sector and one of them in the public sector, will soon begin accepting cryptocurrency payments. The introduction of this new service by Coinbase shows the appetite institutional investors have for the crypto asset class. It’s also quite convenient that Coinbase quietly launched this service very close to the recent bottom in prices. Are institutional investors acquiring BTC during the crypto crash of 2018 in anticipation of the large capital inflows that will happen as a result of increasing institutional adoption? “An exchange-traded product tracking five of the largest cryptos has become a darling among traders even as the market for digital assets continues to dump. The ETP saw trading volume of over 425,000 CHF (the Swiss Franc is almost at parity with the US dollar at the time of writing). This pales in comparison to exchange-traded products in the U.S., some of which measure their daily trading volumes in the hundreds of millions. But the Amun Crypto Basket is showing volume well over twice that of any other ETP available in Swiss markets. NASDAQ is planning on creating futures contracts for crypto. 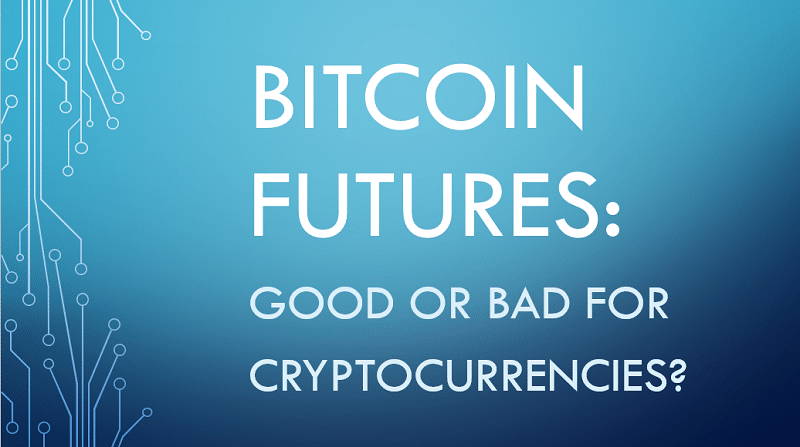 However, there hasn’t been a whole lot of detail disclosed about these futures contracts. It hasn’t yet been revealed if these contracts will be settled in bitcoin or in cash. The only thing we really know at this point is that this is supposed to set a new regulatory standard for this type of financial instrument and that it will incorporate the SMARTS system used by NASDAQ. The stock markets surveillance system (SMARTS) used by NASDAQ consists of hundreds of algorithms that work to sniff out suspicious market activity. It’s not hard to see why using this system might inspire confidence on the part of larger investors. Back when news of the Baakt exchange being created went viral, it was rumored that Starbucks would be accepting bitcoin as a result of their involvement in the deal. These claims were never confirmed by the company, though. But this week, at the Consensus Invest conference In New York, Baakt CEO Kelly Loeffler said that Baakt is actively involved in helping Starbucks make crypto payments for coffee a reality. While Starbucks accepting crypto would be significant, an actual government accepting crypto for tax purposes would be an even bigger deal. One of the biggest pieces of recent cryptocurrency news came out of Ohio this week. The state of Ohio will officially begin accepting bitcoin (BTC) as a form of payment for 23 different business taxes. This might be one of the biggest developments in the history of crypto so far. A major criticism of crypto has always been that it can’t be used for important transactions like paying taxes. Some even say that fiat currencies have greater value for this reason. That logic no longer holds up. Ohio has set the precedent for a government to accept cryptocurrency as a legitimate form of payment for taxes at the state level. The state of Ohio is one of the first in the world to do this. How much longer until governments accept crypto at the national level? In summary, don’t sweat the crypto crash of 2018. If history is any guide, this is par for the course, and the next all-time high will shatter all previous records. Two big criticisms of crypto have always been that it can’t be used for simple things like paying for a cup of coffee or paying taxes. All of this is changing in a big way as we head into 2019. That’s good news for the market and the future of this asset class. With futures contracts sponsored by the second largest stock exchange in the world and an OTC service for institutional investors by the largest American-based crypto exchange, big money is about to flow into crypto. It’s only a question of when. In spite of the crypto crash of 2018, there has never been a more exciting time for crypto enthusiasts. It is precisely during times like these that smart money is accumulating and buying at deep discounts. Subscribe to the GSB newsletter for our most recent in-depth analysis of the crypto market, cannabis stocks, and mining stocks.